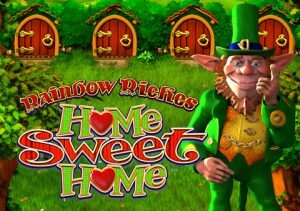 Barcrest’s lucky leprechaun is back for more Irish-fortune-themed mayhem in Rainbow Riches Home Sweet home. The latest instalment of this hugely popular series keeps to the usual formula of simple design, wild extras and free spins. Play this 5 reel, 50 payline video slot on your PC, tablet or mobile from between 10p and £500 per spin. Knock-Knock Bonus feature – land a fully stacked leprechaun symbol on reels 1 to activate this round. You’ll see 4 doors above the main reel set. Between 1 and 4 of these will open when you trigger the feature. Each open door will reveal a symbol. All instances of symbols shown in the doors on the reels below turn into a wild. A new payout calculation then follows. More goodies are on offer if you’re lucky enough to see the Fairy appear in 1 of those doors. With a wave of here magic wand, she’ll turn between 2 and 5 reel positions wild. Free Spins Bonus feature – a fully stacked Leprechaun on reel 1 plus wilds on reels 3 and 5 triggers this extra. Your reward here is 8 free spins. The Knock-Knock Bonus feature take place before the free spins begin. These will be in play throughout each of the free spins. You’ll also be given the chance to play in Big Bet Mode. The price of these 5 linked spins is £20, £30 or £50. In return for that extra investment you can look forward to spinning with an enhanced paytable (which offers maximum rewards of up to 20 times your stake rather 5 times your stake for the Rainbow Riches logo), Leprechaun Bonus symbols that can nudge up or down to trigger the Knock-Knock Bonus feature or spins with the royal values removed. The Rainbow Riches series remains a favourite with players and Rainbow Riches Home Sweet home sticks to the tried and trusted recipe. The combination of in your face design and potentially explosive features is present and correct here. If you’re a fan of this simple blend then Rainbow Riches Home Sweet Home should be right up your street. If you like the Irish luck theme, I would suggest you try Yggdrasil Gaming’s Rainbow Ryan.